This week’s Petit Elefant Quote of the Week is a good one. A summery, ocean-y, happy one. Are you liking this series? I am, because I’ll tell you what: I have an obsessively huge repository of good quotes taking up notebook after notebook and one entire Pinterest board. For reals. If you’re just getting started, we’re on week 6 of the new inspiring quote series. If you’re interested in catching up, here are links to week 1, week 2, week 3, week 4, and week 5 of the Petit Elefant Quote of the Week. 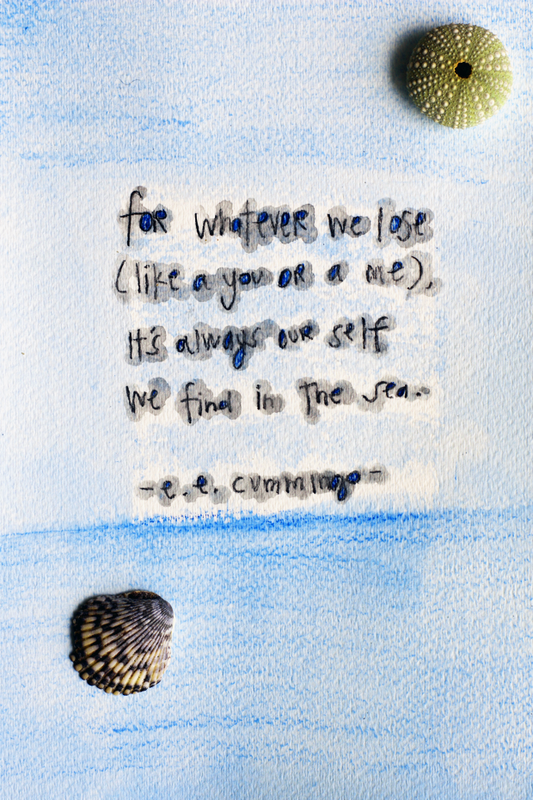 This week’s Petit Elefant Quote of the Week is from one of my favorite writers, poets, of all time, e.e. cummings. Do you know his work? It makes me feel floaty and ethereal, in the very best kind of way. And Mister Cummings talks a lot about things that make me happy, like the ocean, and roses, and babies. You know, the simple but happy pleasures in life. we find in the sea.